Grab your pressure cooker (or slow cooker!) and throw together this tasty soup in record time. With minimal prep and tons of flavor, this Instant Pot Butternut Cauliflower Soup is sure to be a new Fall favorite! While everyone was out snagging their first Pumpkin Spice Latte of the season, I was curled up on the couch with a bowl of butternut squash soup. It’s clear where my Fall loyalties lie. I needed something quick and comforting and a hot steamy bowl of Instant Pot butternut cauliflower soup was a heaping bowl of perfection. Ever the opportunist, I snagged my frozen stash of Fall veggies from the freezer and put them to work so I didn’t have to. And by work, I’m 100% referring to the always-daunting task of peeling and chopping a rock-hard butternut squash. It seems fitting that one of my favorite veggies would play so hard to get, right? Ugh what a pain! By using frozen butternut and cauliflower I was able to save time, money, hassle, and precious sanity. After all, I don’t have much to begin with! Of course you could also buy the fresh chopped butternut squash that the grocery stores start stocking this time of year, or even opt for slaying that dragon all by yourself with some trusty knife skills. In fact, why don’t you bring those baller knife skills over here and come help me in my kitchen! So whether you follow suit with my shortcut du jour or make use of that beautiful butternut sitting on your counter, you’ve GOT to make this soup! Holy cow it’s delicious! For a gloriously VEGAN soup, you can allow a spoonful or two of the soup to cool and give it a little taste test to decide if you want to add more broth or a creamy element like canned coconut milk or even a little almond milk. I’ve had friends try it with this soup and they loved the results! I opted for frozen veggies for convenience without sacrificing flavor, but you can 100% use FRESH VEGGIES veggies, or a mixture of fresh and frozen too! Simply adjust cook times as needed. Fresh veggies take a bit longer to cook but the deliciousness will remain the same! GLUTEN-FREE? You’re good to go! 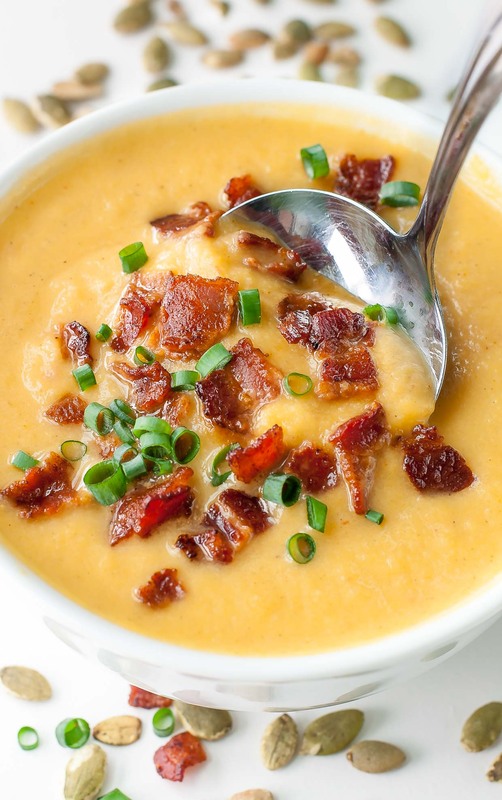 This soup is GF and can be topped with anything from pumpkin seeds and cheddar to bacon and chives! T-REX OPTIONS: Some readers have added sausage, shrimp, or smoked kielbasa to the soup and loved it. Feel free to follow suit if you’d like! Chicken broth and bouillon are also used with great results. 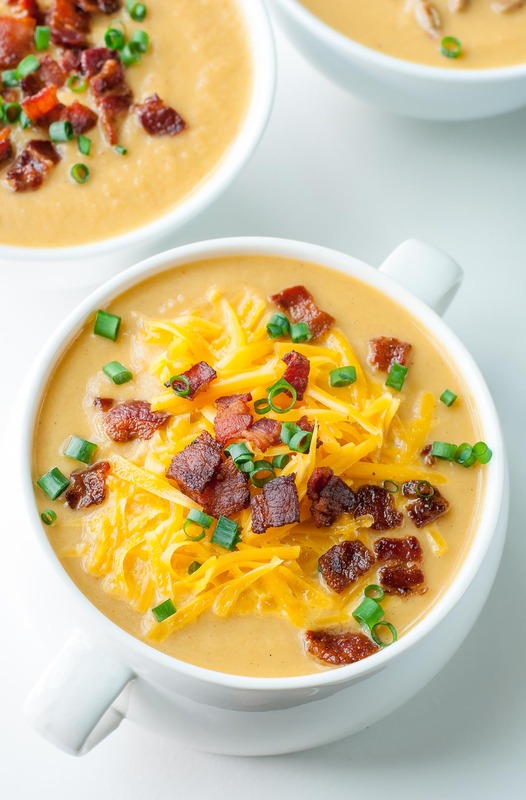 This butternut cauliflower soup is so super versatile, so deck it out with your favorite extras to flavor it as you please! Grab your favorite accoutrements and get sprinkling! Here are a few tasty topping ideas to get you started; add a few or a bunch! Or serve it with your favorite panini for dunking. 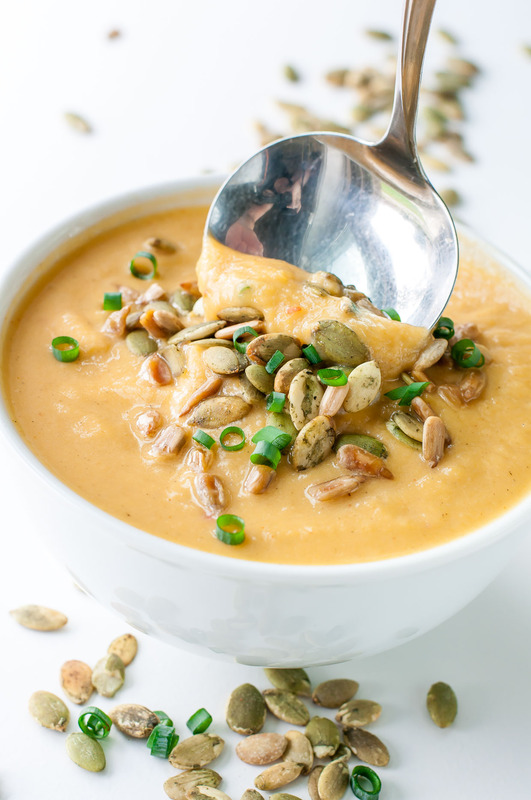 However you serve it, this Instant Pot Butternut Cauliflower Soup is sure to rock your spoon! Grab your Crock Pot or Instant Pot and throw together this tasty soup in record time. With minimal prep and tons of flavor, this Butternut Cauliflower Soup is sure to be a new Fall favorite! green onion and cheddar are probably my favorite mix-ins for this soup - YUM! This recipe was developed for a pressure cooker like the Instant Pot - see post below for slow cooker instructions. Turn pressure cooker to sauté function and heat oil. Sauté onion until tender and golden, adding the garlic towards the end. Add cauliflower, butternut, veggie broth, and spices. NOTE: If the broth you're using is on the saltier side, feel free to skip the salt and simply add it in at the end, tasting and seasoning it as you go. Same goes for the red pepper flakes - if you want a super mild soup you can always sneak some in after and season as you taste. I added a teaspoon of pepper flakes to mine and it gave the soup a delightful zing! You could also give this a fall-spiced flavor profile if you'd like by adding cinnamon and nutmeg to the soup. I've had it both ways and love it! Set to high pressure for 5 min. Due to volume, soup should take around 15 minutes to come to pressure and countdown the 5 minutes. Once it's complete, turn OFF then switch to vent to quick release the pressure. The soup should take about 20-25 minutes from sauté to pressure release. Blend using an immersion blender (my favorite space-saving appliance ever!) or allow soup to cool (hot liquid expands) and blend in batches in your blender or food processor. Top with your choice of toppings and dig in! See post below for slow cooker instructions - this soup works great in the crock-pot too! I opted for half and half for this recipe, which is equal parts cream and milk. You can also use all cream or all milk if you'd like. Even cream cheese would work to add a little creaminess if you're jonesin' for it. All are delicious options, let your tastebuds (and the contents of your fridge!) be your guide. You can add a little, or a lot! Go fresh OR frozen! I opted for frozen cauli and butternut to save time in the cooking and chopping department. Adjust cook times as needed if using fresh veggies, approx. 15 minutes on high pressure should do the trick! The general rule of thumb with pressure cooker soups is that you can always add more time as needed, so don't fret if you're new to using a PC. The forgiveness curve of soup recipes is almost always in your favor! Nutrition Facts below are an estimate gathered using an online recipe nutrition calculator. Values are for each cup of soup and are calculated before topping options. Adjust as needed based on toppings and mix-ins and enjoy! This soup will keep for up to 4-5 days in the refrigerator, as needed. Simply store the soup sans-toppings and add all your goodies upon reheating. Easy peasy! No pressure cooker? No problem! This Instant Pot Butternut Cauliflower Soup can easily be made in your handy dandy crock-pot. You can use frozen veggies, fresh veggies, or a mix of the two. Set slow cooker to high and add chopped cauliflower, cubed butternut squash, veggie broth, onion, garlic, green onion, thyme, paprika, red pepper flakes, and salt. Though it’s optional, for max flavor, sauté your onions and garlic first. Once the veggies are fabulously tender, turn off the crock-pot and add your dairy. Blend using an immersion blender (my favorite space-saving + soup-saving appliance ever!) and you’re good to go. Add any additional seasoning to taste, then pile on the toppings and dig in! If you get a chance to try this tasty Instant Pot Butternut Cauliflower Soup, let me know! Leave some love in the comment form below or tag your photos with @peasandcrayons on Instagram so I can happy dance over your creation! looking for more pressure cooker recipes? My wife cannot stop talking about how amazing this soup is. We sauteed some chopped chicken in olive oil, salt, pepper, and ground thyme and dropped it into the otherwise finished soup. It added texture and heartiness and we’ll make it again the same way! So good with the cheese, bacon, and scallions. Be warned: the soup itself smells a little funky. Thanks Derek! I’m so thrilled y’all are loving the butternut cauliflower soup! 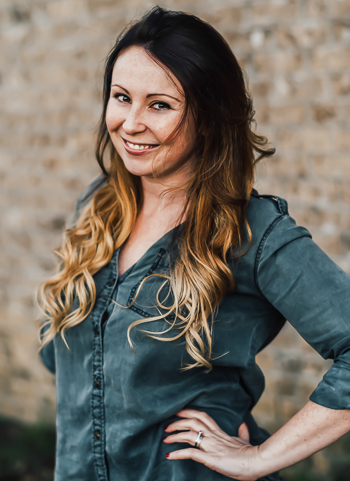 Hi Jenn. Just made the soup & it’s absolutely delish! If I may, i’m Keto & would appreciate if you could include the macros (net carbs, fat, calories & number of servings if possible. Thanks in advance. Ok all set! The net carbs should be 13 g per serving once you subtract the fiber. Hope this helps! I did the calculations with the dairy option I used (half and half) and before toppings since we all choose different ones for the soup. If you need to do any extra calculations based on tweaks, free calculators like MyFitnessPal should be able to help too! Loved the idea of this soup. Added a honey crisp applebased onotherrecipes I had looked at. And I’m not kidding when I say I added 3x the spices after cooking. And a bag of shredded parm. With those additions, it was delightful. Just made this today for the first time. I used low fat sour cream instead of milk – worked well but a bit too thick so I also added a half cup of 1% milk. Initially followed the recipe but added a bit more salt, nutmeg and cinnamon. Turned out to be delicous and so easy. Thanks for the recipe !! Loving the addition of sour cream and so glad you enjoyed the recipe Sharon! Thanks! Thanks for sharing this! Because I didn’t have frozen cauliflower here, I used yukon potatoes in its place. Worked well! I seasoned the potatoes before putting in the pot. Also took part of the batch after cooking (i always experiment) and added curry powder and cumin because we love Indian food in our house. It was delicious! This is a great base and, like any other recipe I have, found that we can eat it as is with our favorite garnishes on top or with different spices to change it up. It’s a keeper! We loved this soup. My husband wants it every week now. I did add the red pepper and a little black pepper. Delicious!!! Thanks! This might be the most bland soup I’ve ever made. It had zero flavor, even with the cinnamon and nutmeg added as well as some salt. I had this at a friend’s house and want to make for a party this weekend. If I want to make it a corn-y soup to serve with crabcakes, would you suggest adding frozen corn along with everything else or omitting one of the other ingredients? So stoked you’re loving the soup, Lisa! Thank you! Are you looking to give it a corn chowder vibe? When I was staying with my in-laws one weekend I made a butternut corn seafood chowder and legit wanted to lick the bowl clean (I need to test it in my kitchen with measurements and blog it for sure!) – I think I added 2-2.5 cups frozen corn as well as some shrimp and crabmeat to the mix. It could totally be done without seafood too though – I love your idea! I wouldn’t nix any ingredients here but either add the corn at the beginning if you want it pureed with the rest of the ingredients or add it at the end (maybe steam/warm it first for that option) for whole kernels in the soup. Then you’ll just want to adjust the seasoning to taste by adding a little extra of whatever you’d like. You could also opt for an extra clove of garlic if you’re a fan! Is the soup you sent the link for the same just in a slow cooker? I’ll give one of these a try with an extra creamy coconut milk and let you know how it turns out. Thanks! I would love to try this, but need to make it dairy free. Have you tried it with coconut milk rather than cream? Hey Karissa! I actually love using coconut milk! I haven’t done it with this particular soup yet but have with this one and it’s super similar! If you want to give the flavors a little boost you can even add curry powder and some extra spices to the mix to give it some flair! A little bit spicy, even when cutting the amount of red pepper flakes in half (I’m a baby when it comes to spicy stuff though). This soup is very yummy and super easy to make!!! Delish! My hubby didn’t even realize this was NOT potato soup! Easy, lots of flavor and way to pack the good veggies in!!! Yay!! I’m glad you both enjoyed it! 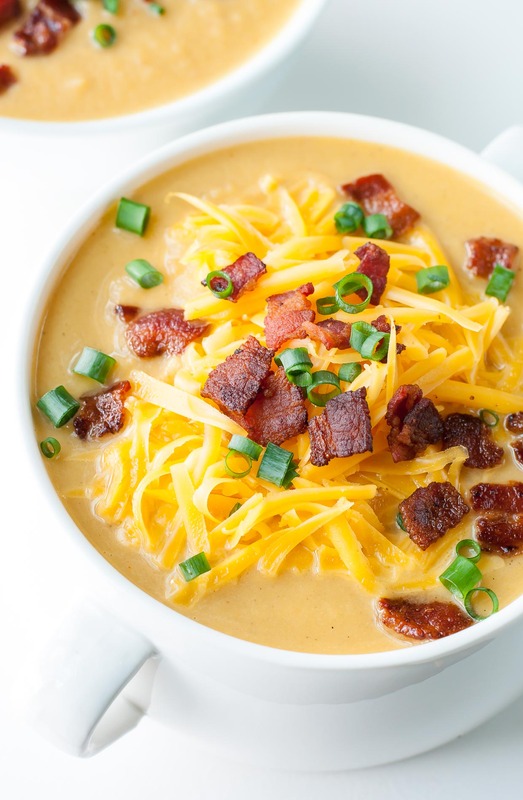 This has become one of our favorite soups! It is so easy, and really easy to adapt to whatever I have on hand (bacon? no bacon? acorn squash instead of butternut? Go with it!). Love it! So stoked you’re enjoying it Stephie! Thanks so much! I found this soup to be boring and tasteless. It needs at least a half teaspoon of salt; I did not use low salt broth. I think the soup should be good on its own without adding a lot of extras like cheese and nuts. I tried parmesan, s&p, a little cream cheese and then some vermouth to give the squash, which is always pretty boring on its own, some taste. Next time, I’m going to flavor with nutmeg instead of the paprika-thyme combo ( typical of many butternut squash soup recipes). I’ll also add more cream. I used fresh squash and cauliflower. Hey Becky! Sorry you found the soup itself boring. The toppings were intended to be everyone’s way of flavoring the soup to their tastes as I know some friends like a little cheese and spice in theres while others like the optional nutmeg-cinnamon seasoning added in, so I have all the suggestions in the recipe for y’all to season to taste. I have so many soup recipes that are flavor bombs on here but wanted to leave this one a “choose your own adventure” sort of deal, lol! I made this tonight to reheat for tomorrow’s supper. I usually get home about an hour before I have to put the kiddo in bed on school nights. I had to use fresh squash, because I couldn’t find frozen. It turned out great and was very easy to make. It looks and smells delicious. Thanks for the healthy and easy recipe. made this last night – so tasty! I wanted to do a play on a butternut squash shrimp bisque from a restaurant in New orleans that i love, so i stirred in 2 teaspoons of shrimp paste with the onions and garlic (and used chicken stock since that is what i had on hand). Threw in a bay leaf as well and subbed white and cayenne pepper for the red pepper flakes – delicious!!! You had me at shrimp! LOVE IT Anissa, thanks for sharing your tasty additions! I made this for my family’s lunch today, utterly delicious (even though I did Forget TO add the thyme). Yesterday I was bought a multicooker & it has a soup function on it. I Followed this recipe but just switched to the soup function after frying the onion & garlic. I used fresh veg & single cream, worked a treat. Next time I make this I will add less spice (due to my two boys) & probably 2 & a half cups of veg stock. A big thanks from the UK ? Hi, I made this delicious soup today in my Instant pot. It was so easy and so much flavor for so little effort! I loved using frozen butternut squash and frozen cauliflower! Thanks for sharing this great recipe ? So 5 minutes on high pressure for frozen, is the 15 minutes for fresh on low pressure? Can I confess I’ve only ever used the high pressure setting on my pot? lol! My time for the fresh squash is a bit of a guesstimate; I plan on testing it with all fresh veggies next time I make it for the family so I’ll update this post with my exact times! If you beat me to it, I’d love to know what time/pressure you used! 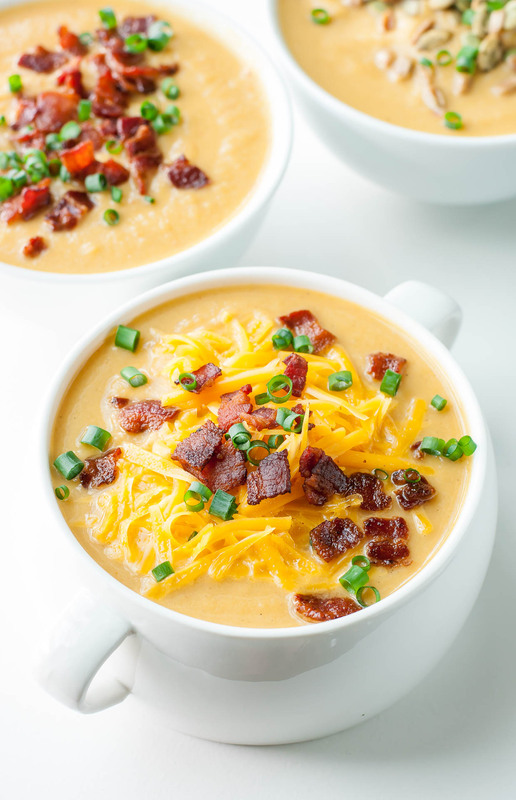 Usually with blended soups there’s a lot of wiggle room with IP times, which is a relief since it’s so fun to make up soups on the fly with whatever is in the cripser or freezer that day! 😉 Happy New Year, Jan! Thank you! This was my first IP creation and it was awesome. Once I get more comfortable experimenting with it, I have a few other soups in mind! Thank you for sharing! 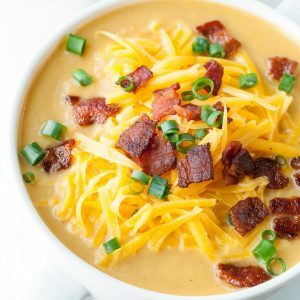 Great fall recipe, thank you, love all of these ingredients, including the squash, with the cheddar bacon topping combo, nice! Delicious! My sister made this for me, but seeing how easy it was, I’m going to be making it too! I added a little extra salt and it was delicious sans toppings. Then I added a dollop of sour cream, and that was great too! I may try cinnamon next time. This soup cooked perfectly and was so delicious! Thanks for sharing the recipe! Does anyone know how this soup will hold up if frozen? It sounds delicious! Thank you! Great. Thank you for the response. Making it this week. Just an FYI….You can get the butternut squash (peeled and cut in chunks) and cauliflower rice at Costco. It’s in the refrigerated vegetable section. Amazing recipes! Just wanted to drop a butternut squash tip. Those can be peeled in two minutes with a potato peeler. Use a dish towel to grip the squash! great photography and great recipe! I’m making this tonight! Hope you adore it Jennifer! Thanks for including the slow cooker version for those of us without pressure cookers! I pinned and will be making when It gets to be soup weather here! I made this recipe for dinner last night and both the hubs and I loved it! It is super silky and luscious but actually good for you – whaaaat?! Totally delish alongside a good grilled cheese sandwich – just sayin’. Also – for anyone wondering – I used fresh butternut squash and fresh cauliflower in place of the frozen, so I set my pressure cooker to 15 minutes instead of 5 and it was the perfect amount of time. This is SO going on the dinner menu ASAP. Yay!!!!! Hope you and the hubster LOVE it!